When we last saw the merfolk Planeswalker Kiora, she had narrowly escaped from a battle with a deity, the sea god Thassa on Theros. Although she hadn't gotten what she wanted out of the fight, neither had she left empty-handed, fleeing Theros with the sea god's sacred weapon in hand. Now she returns to her home plane of Zendikar, ready to fight the monstrous Eldrazi that threaten her world with destruction. They are massive, unstoppable. But the Eldrazi are not only monsters. 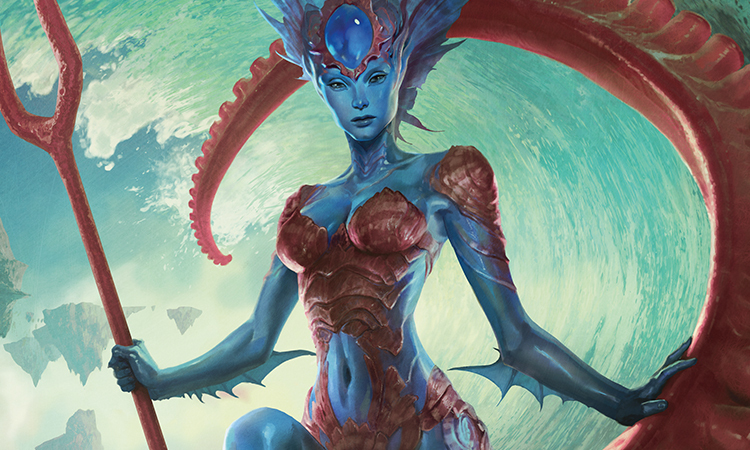 The merfolk of Zendikar have long worshiped them as deities. And Kiora has already faced one god and lived to tell about it. "Come on!" she said in a dream. She took Turi's small, webbed hand in her own and tugged. "Elder Misha's telling stories. Keep up! We're gonna miss it!" She pulled her sister along with her, and the two young merfolk sat down on the beach with the other youths just as Elder Misha began to speak. The other adults had all retreated to the far end of the beach, barely visible in the moonlight, where they told their own stories—stories for adults. Misha's story was for children. The matriarch spoke above the surf in a soft but piercing voice. "Long ago, but in our very own sea, the great god Ula was preparing for a hunt." Ula, who had made the seas—the ocean-dwellers' highest god, dour and proud. She stuck out her tongue at him. Turi stuck her tongue out, too. "Ula was furious at the dolphins, whose frolicking he took as an insult to his dignity. And so he planned to hunt one of them, as an example to the others. But dolphins are tricksters, and beloved of Cosi, the greatest trickster of all." Cosi stories! All the best stories were Cosi stories, but the other adults never listened to them. "And so Cosi decided to foul Ula's hunt. The night before the hunt, Cosi snuck to Ula's bedside at the bottom of the sea and swapped his great spear for a gull's feather, which he enchanted to look exactly the same. Emeria saw this from her lofty perch in the sky realm, but she said nothing, for she enjoyed watching the other two gods quarrel. "In the morning, Ula set out for his hunt, none the wiser. He gave a great bellowing speech about his dignity and his station. The dolphins clustered around to hear, for they had been told by Cosi that they had nothing to fear. This only made Ula angrier. He struck with his spear-that-was-not-a-spear, once, twice—but the dolphins only laughed, for in truth it was a feather, and could do no worse than tickle their sleek sides." Elder Misha did a shockingly good impression of the high, chittering laughter of a dolphin. The children giggled. "Ula did not understand how the dolphins were unharmed, but he knew when he was being mocked. He lashed out at them more, struck again and again, tried to twist his spear inside the wounds he had not caused. The dolphins shrieked with glee. Enraged, Ula snapped the useless spear across his knee—and found himself holding two halves of a simple feather. The dolphins laughed so hard you can still hear them laughing, even to this day . . ."
Kiora hit the sand hard on her hands and knees, ears ringing, vision swimming. Kiora preferred to swim—to push down and down until the coldest, darkest depths of two worlds' oceans ran together to become one, bridging a senseless chaos far darker, far colder. But in this particular case, she was lucky to have arrived at all. She coughed, sucking in air, gills opening and closing. She was trembling, exhausted, filthy—coated in muck from the bottom of an ocean a world away. Her hands were numb, so she had no idea if she was empty-handed. She hoped the mud wasn't the only thing she'd brought with her from Theros. Her vision cleared. She looked down. There, still clutched tightly in both hands, was the weapon of a god. She let out a long, rattling laugh. I won, she thought. I beat a god. I won! The two-pronged spear was unwieldy, longer than she was tall, though it had been far larger when the sea god Thassa held it. It seemed to have hardly any weight at all. As Kiora watched, the starfield that marked it as the work of a god—what the people of Theros called the touch of Nyx—seemed to thin and dry, as though evaporating, as though the air of this different world was anathema to the stuff of gods. Soon the bident took on the texture of dried coral. Disappointing. Kiora hoped it was still a weapon worthy of a god. But even if it was just a spear, it was the finest trophy she'd ever taken. Perhaps she'd give it to Turi, to go with her other mementos of Kiora's travels. If Turi was still alive. If any of them were. If the Eldrazi hadn't killed them all. Kiora stumbled to her feet. She was still dazed after a massive magical battle, being choked nearly to death by a god, and pushing through a desperate, messy planeswalk. But this was Zendikar. It wasn't safe, especially not now. She stood on the shores of Tazeem. Waves lapped against the beach. The sun shone. Great stones reached into the sky, defying the bonds of gravity. 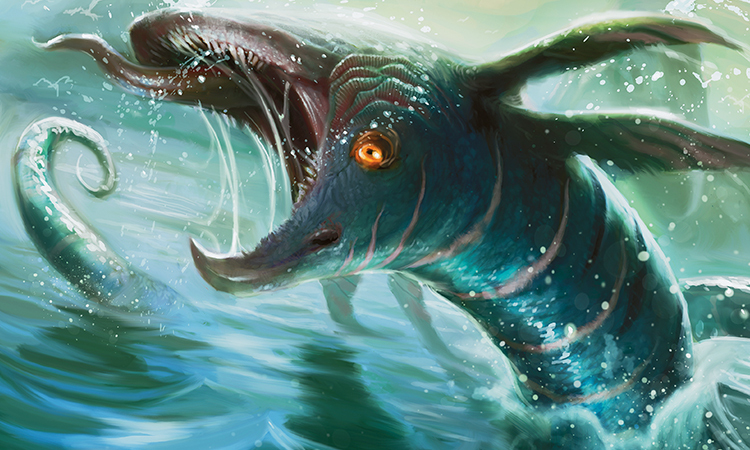 Kiora whooped and ran out into the slapping surf, letting the water of Zendikar's sea wash away the mud of Theros. The bident sang a brief, clear note when it hit the water. Only that—but it was promising. Cool, clean water flowed over and around her, washing the sea-bottom taste of her fight with Thassa out of her gills. She was clean, and she was free, and she was home. She dove into a sea that tasted like no other, anywhere. She sped along the shore, spun, dove, and careened toward the surface, breaching in a huge arc. She twisted to look, hit the water at a strange and stinging angle, and forced her way back to the surface. The beach looked wrong. It sounded wrong, too, each wave dissipating against it with a hiss and leaving the sand—if that was what it was—completely, impossibly dry. She dove, plucked a crab from the surf, and climbed onto the rocky shore near the dead beach. "Sorry, friend," she said, and tossed the crab onto the unnatural gray beach. The crab righted itself, stood tall in a threatening display, and scuttled back into the water. Satisfied that the stuff wasn't going to instantly kill her, Kiora stepped out onto the beach. The texture was fine, more dust than sand, and she could feel it draw the moisture from her feet. What had been solid stones were now pitted and crumbling lumps. Was this what the Eldrazi were doing to Zendikar? A gust of wind whipped up puffs of the dust. Kiora's body reacted as though she were underwater—clearlids closed, lungs shut off, gills open. She spat in disgust and dove back into the sea, blinking. She imagined that grit circulating through the ocean, clogging everything, until life became impossible. Kiora gripped the bident and focused her will into it. Slowly, as she floated there, her senses expanded. Tides and currents, continental shelves and underwater vents, algal blooms and anoxic zones . . . she felt them all, stretching out around her, like the fingers of her own hand. The vile beach behind her was a great dead weight, a hole in her awareness. Along the shore and even out on the sea bottom, in the open ocean, she could feel more dead places, robbed of all life by the encroachment of the Eldrazi. 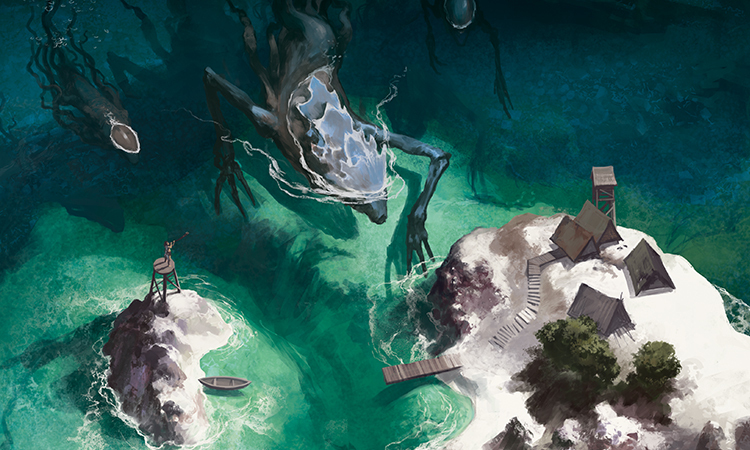 Eldrazi in the oceans! Bad enough when they'd attacked dry land. Now they had taken to the water, swimming through her ocean, sapping the life out of it, scraping away at the sea bottom. She could feel them. But the Eldrazi weren't the only things out there. 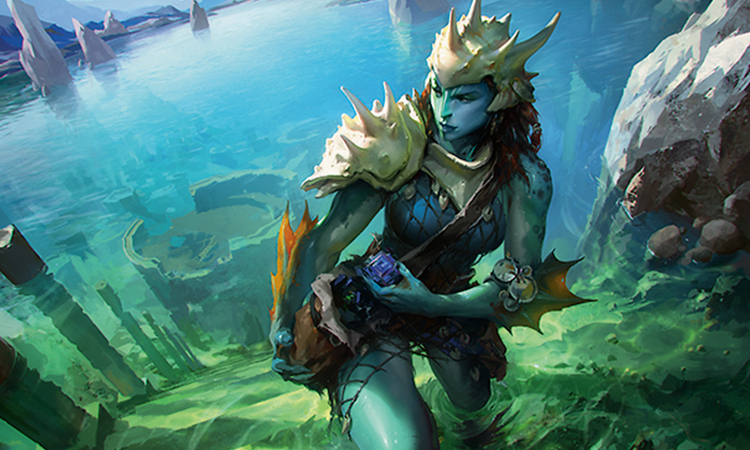 She couldn't sense them, but the merfolk of Zendikar were still alive out there, still fighting. They had to be. Kiora swam away from the lifeless shore and turned northward to follow the coast, looking for any sign of habitation. In some places, Zendikar was as it had always been. In others, it was a blighted wasteland. Merfolk settlements sat abandoned on the coastal plain, swallowed by seaweed or reduced to shifting, lifeless ruins choked by dust. Kiora cruised low over the first few to look for survivors, but found only small Eldrazi probing the ruins, sifting through the rubble, looking for gods knew what. The gods do know what, she thought. 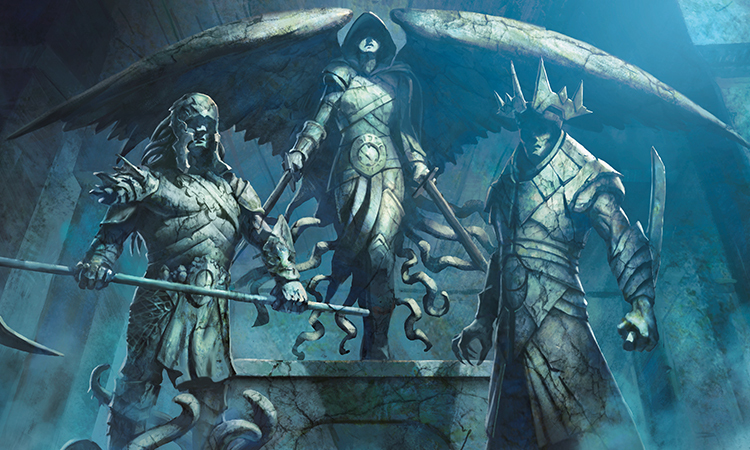 Ula, Cosi, and Emeria—the gods of Zendikar's merfolk, since unmasked as the Eldrazi titans Ulamog, Kozilek, and Emrakul. Were they gods? Did they have a plan for Zendikar? Or were they just mindless beasts, consuming without thought or purpose? After spotting the Eldrazi poking around the ruins, she kept well above the abandoned settlements. Looking for unlikely survivors wasn't worth being caught unawares in tight confines. As the sun sank low in the sky, she found a cave high on a cliff face to stay the night. 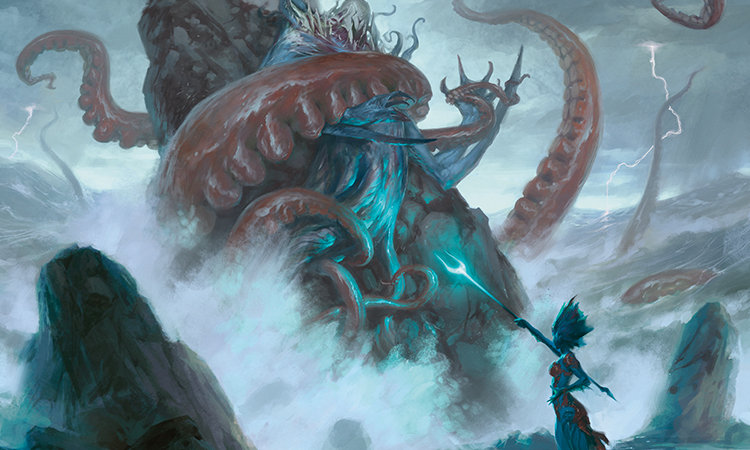 With the last of her flagging strength, she called a giant octopus from Zendikar's depths. It lifted her up to the cave, then settled in to guard her against Eldrazi. Beyond the narrow opening was an open cavern lit by a skylight. The chamber was worked stone, and at the far end stood an altar to the Three. She had traveled with her tribe to an altar very much like this one more than once, to lay offerings at the feet of uncaring stone gods. The supplicants brought hedron shards and land-fruit for Emeria, shells and pearls for Ula—and nothing for Cosi. She and Turi had snuck back in the night, to leave Cosi knotted ropes and whisper secrets in his ear, and his altar was never bare when they arrived. They'd been children, offering their devotion to the forbidden god just for the thrill, the sense of transgression. She'd wondered even then how many of her elders had done the same in their youth—and how many had never stopped. No one worshiped Cosi. Everyone knew that. The adults refused to listen to the stories about him—not, she learned later, because the stories were childish, but because they were blasphemous, and it was shameful to hear them. So why had they let anyone tell the children those stories? Why not stick to the pious stories, the daytime stories, of the three gods creating water, earth, and sky? Why tell stories that made the gods seem foolish? Why build statues of Cosi at all? A shiver went through her. The gods' gazes were blank, pitiless. It would be easy, all too easy, to revere them still, to think that the monstrosities that had risen really were gods, worthy of worship. It would be easy . . . except that she remembered the stories of Cosi stealing Emeria's robes, or tricking Ula into swallowing a stone. She remembered sitting, shivering, on that moonlit beach, snickering at the hubris of the gods, the warm bodies of her kin quaking with laughter beside her, relentlessly mortal and alive. Those stories had taught her not to fear gods . . . nor to trust them. Her childhood, she had come to understand, had been a quiet battleground. The respectable merfolk of the world would prefer to wipe the worship of Cosi from existence, to forget the trickster god entirely. But his worshipers, secret and otherwise, would never let that happen. If they wanted to build statues of Cosi, to leave him things, to tell the children heretical stories . . . who was going to stop them? A trickster could make the tribe's troubles disappear in the night, now and then. But they could do far worse than that, too, if anyone tried to stop them. And there might be a trickster in any tribe. Other cultures did not tell children stories like this—about mocking tradition and defying the gods. But other cultures did not have Cosi. Cosi had kept vigil. His tricksters made sure they remembered that even gods were fallible. How many would have turned to the monsters' side, or given up all hope, or simply gone mad when the Eldrazi rose, if not for those stories? Had that been the point all along? Or had they just gotten lucky? Slowly, holding her breath without meaning to, she walked up to the statues of the Three. She looked up at them, towering above her. And she spit in Ula's blank, stupid face. "You do not reign here," she said, her voice echoing off of damp stone. "Not now. Not ever." Nothing happened. Nothing changed. There was only spit and stone and silence. Kiora snorted, then curled up to sleep beneath the statue of Cosi. The only honest god, she thought. We always knew you were a liar. Under the stony eyes of false gods, clutching her stolen weapon, Kiora found uneasy sleep. It was late the following day when she found her people. She saw the Eldrazi first, swarming in the water and swooping down from the sky. They'd surrounded a school of merfolk and herded them away from the shore. Kiora gripped the bident and sped up. There were perhaps a hundred merfolk, swimming in tenuous formation. 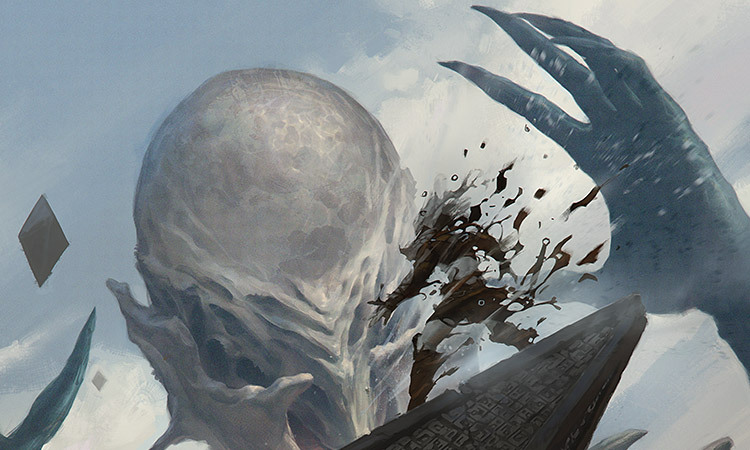 Aquatic Eldrazi—Ulamog's lineage, from the look of them, with featureless, bone-white heads and masses of writhing tentacles—had gotten between them and the shore. 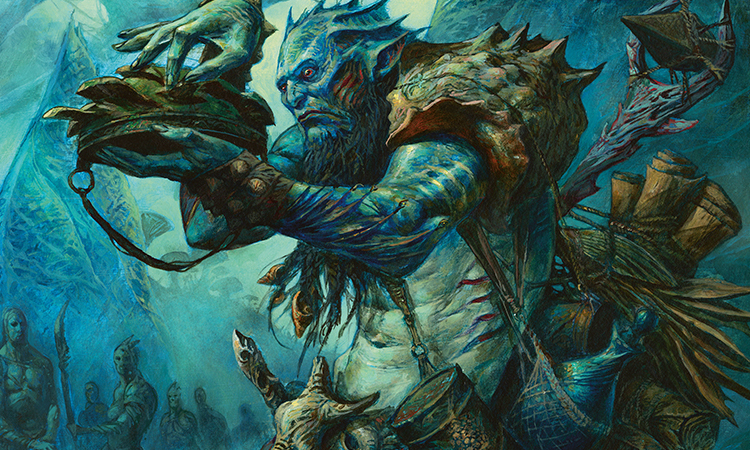 There were soldiers among the merfolk, keeping the Eldrazi at bay with nets and spears, but the creatures were picking off stragglers. One of the Eldrazi grabbed a merfolk and squeezed. Then it relaxed its tentacles, but instead of a corpse, all that came out was a billowing cloud of that awful dust. Kiora shuddered. 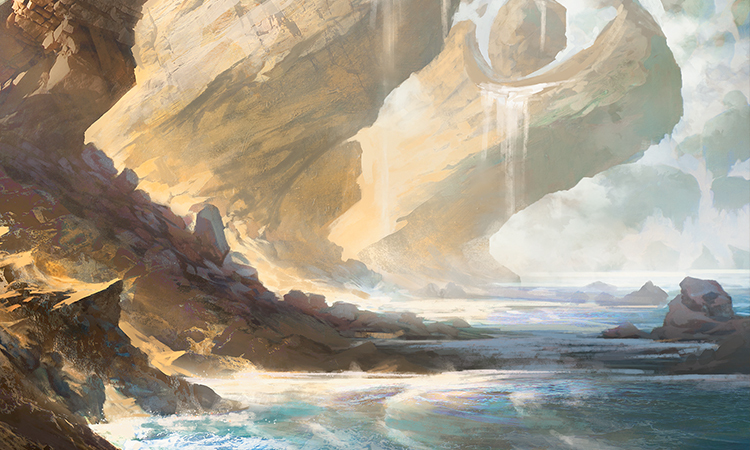 She called to the great creatures of the deep—no need to summon, not when Zendikar would offer up allies freely. She called, and heard them answer. In the meantime: the bident. Finally! She reached out, took hold of some nameless strand of water, and flicked the bident. 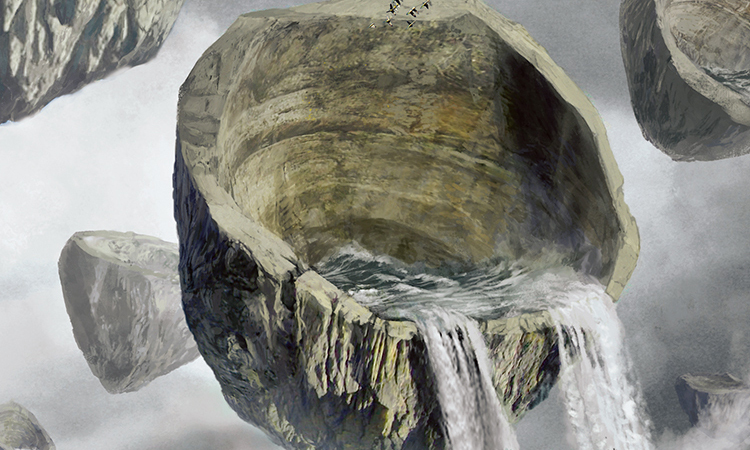 A vortex formed near one of the Eldrazi, sending it tumbling. Tricky. She tried again, a bigger flick, and sucked another Eldrazi into the deeps. She laughed, bubbling. Oh, yes. This was good. But the bigger Eldrazi wouldn't go down so easily. More vortexes—and then her allies were there, a few giant octopuses and a great gnarled serpent. They set to work, swiping up the smaller Eldrazi and wrestling with the larger ones. Meanwhile, the merfolk took advantage of her distraction to swim for shore, the soldiers among them hanging back to cover the retreat. One of her octopuses fell, too many of its arms worn through. Another grappled with the largest of the Eldrazi, rolling and pitching through the water. Suckered tentacles intertwined with unnatural sinewy ones, a massive ball of flesh and fury that kicked up enough sediment to obscure the combatants. The first of the merfolk reached the shore, but if that big Eldrazi bested her octopus . . . It needed help. She swam toward shore, channeling power through the bident. It glowed pleasingly. She felt the octopus surge, filled with the strength of the deep. She felt her way through the murky waters to shore and stood, triumphant, as the octopus squeezed the last trace of false, unsettling life out of the big Eldrazi. By the time she was finished and the wounded octopus slithered back into the depths, the beach was full of merfolk refugees. Not a hundred. But nearly. The survivors spread across the beach, huddled in tight-knit groups. It was a hodgepodge of tribes, and even though they were in her home waters, all the faces she saw were strangers. Kiora sat down heavily on a rock apart from the main group, laying the bident across her knees. No one had thanked her, but she didn't begrudge it. They were busy tending their wounds and counting the missing. And who was she, to them? A stranger with a strange weapon. "Kiora!" cried a voice from the throng. A young woman shouldered her way past groups of survivors, eyes bright. She was laden with packs of scrolls. She had just enough time to move the bident aside before the younger merfolk enveloped her in an embrace worthy of an octopus. Turi turned to the survivors behind her, arms still wrapped around Kiora. "It's her!" shouted Turi. "My sister! I told you she'd come back!" Kiora rolled her eyes, still smiling. "What tales have you been spinning about me, little fish?" Turi held her at arm's length and grinned. "Only true things!" said Turi. "I told them my sister's been to places they've never even heard of, and she brings me treasures. And no matter how long she's been gone, she always comes back, even the time I saw her get eaten by a serpent with my own eyes." Kiora shuddered at that memory, years distant. Turi made light of it now, but it had been the most horrible moment in their young lives. They'd been exploring too far out, at Kiora's urging—past the edge of the continental shelf—when a serpent had cruised up out of the darkness to swallow them. Kiora had darted out in front of it, got its attention, and shouted for her sister to swim hard and not look back. Turi had looked anyway, and her panicked face was the last thing Kiora had seen before the serpent's jaws closed around her and the world dissolved, her Planeswalker spark igniting in a moment of boiling panic. It had been months before she'd found her way back to Zendikar and her people. The revelation that there were other worlds than hers paled in comparison to the certainty that she hadn't done enough to save Turi. When she'd finally gotten back, she'd found Turi stick-thin and glassy-eyed, wasting away, killing herself with guilt at Kiora's sacrifice. They'd made a pact after that. Kiora had promised to come back, and Turi had promised to wait for her. Kiora hugged her sister again. "I'll see what I can do. I wouldn't want to let you down." Kiora often brought her trinkets from other worlds. On this trip, she hadn't had the time. "No!" said Kiora, pulling it away with a smile. "I stole it fair and square." "You stole it? From who?" "A sea god," she said. "A real sea god." Turi stuck her tongue out at Kiora. "It's true!" said Kiora, holding up a hand. "Cosi take me if I lie." Turi paled. A couple of nearby merfolk stared. "Kiora," said Turi quietly. "People don't . . . do that anymore. Swear by the gods." "Why not?" she asked, at full volume. "They'll blaspheme against gods, but not against monsters?" "Please," said Turi, through gritted teeth. "Some of these people have seen Cosi. Kozilek. Before he left. Lost family and homes to him. Think about how they feel." Turi groaned—not the point!—but she surely knew better than to stand in the way of her sister's relentless curiosity. "No one's seen him in months," she said. "Or Emrakul. Only Ulamog. Some people are saying the other two have gone back to wherever they came from." Kiora frowned. Was that possible? Could they have . . . left? "I'll believe it when I see it," she said. "What about our tribe?" Turi hugged herself, suddenly looking very young. "I don't know," she said. "I was studying at Sea Gate—"
"I like learning," said Turi, with wounded pride. "So do I," said Kiora. "That's why I travel." Kiora hadn't meant it to sting, but Turi flinched. "So you were at Sea Gate," said Kiora, more gently. "Then what?" 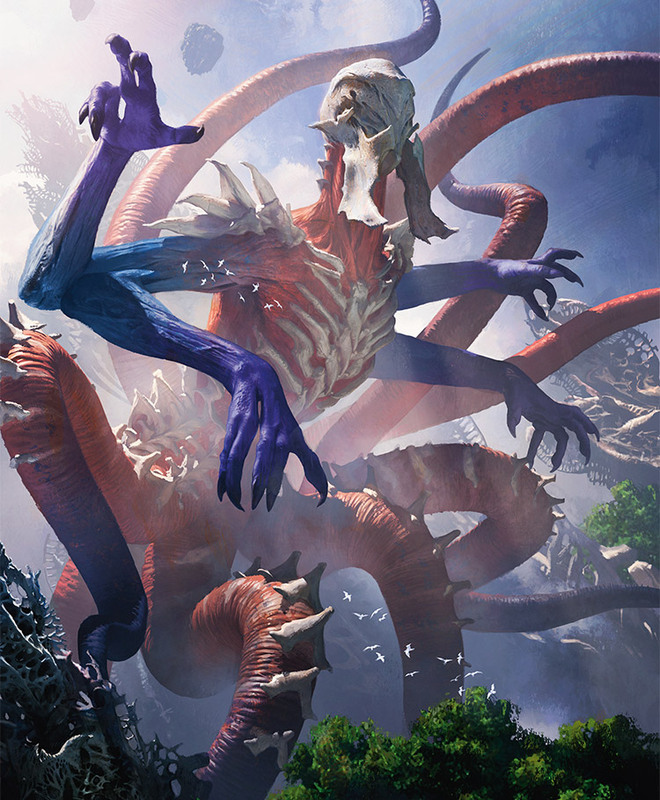 "The Eldrazi," said Turi. Her eyes were distant. "They overran the place. I was lucky to get away. Not . . . not everyone did. I joined up with this group to try to get home. On our way out of Sea Gate, we saw Ulamog in the distance." "Ulamog is at Sea Gate?" Wrong question. She knew it was the wrong question. But she had to know, damn it! "I don't care where Ulamog is!" shouted Turi. "I'm trying to get home, Kiora! To our family. Do you even care what's happened to them?" Now the others nearby looked away, pretending not to hear. Nice of them. Kiora put her hands on Turi's shoulders. "Little sister," she said. "I knew what was happening here. I worried for you the whole time I was away—for everyone, but especially you. You don't know what it means to me to see you well." "Yes I do," said Turi quietly. "Every time you leave, I wonder if you'll come back. And I know that if something ever does happen to you, I'll never find out. I'll never be able to follow you." "If I could take you with me, I would." "No," said Turi, not unkindly. "You wouldn't. You'd want me to stay here. Stay safe. Wouldn't you?" "Nowhere on Zendikar is safe," said Kiora. "Not now. That's why I'm not concerned about finding the tribe. That's why I'm headed for Sea Gate. If nobody stops Ulamog, everyone will die, no matter where they are." Too loud. People turned to look. "Back to Sea Gate?" said Turi. "No." "Kiora, is it?" asked a gruff voice, interrupting what was obviously a private moment. Lout. Kiora disentangled herself from Turi and turned to the stranger. He was old and scarred, with the darkened scales of one who'd spent too long away from water. His accent sounded Sejiri, and he spoke like someone who expected to be listened to even so far from home. Kiora immediately disliked him. "That's me," she said, with what she hoped was grating cheerfulness. "I am Yenai," said the old merfolk. "Thank you for your assistance." "No trouble at all," said Kiora. "We're all on the same side now. Aren't we, Sejiri?" Yenai looked pained, though she wasn't sure why. Merfolk ethnic divisions bred rivalry, not hatred. Had that changed? "Of course," he said. "I hope we're traveling in the same direction as well." "Depends," said Kiora. "I'm going to Sea Gate." It was true. It hadn't been, a few minutes ago. But if that was where Ulamog was, she wasn't going to waste time hiding somewhere else. "We've just come from Sea Gate," said Yenai. "We're not going back." "That's a shame," said Kiora. "I suppose I'll take my sister and my sea monsters and go." "Kiora, don't be stupid!" said Turi. "We're talking about a titan. A god. You can't stand up to that. Kozilek and Emrakul are gone. Maybe—maybe Ulamog will go as well. Maybe they'll all leave us alone. Throwing yourself in his path won't do any good." "There's no shelter at Sea Gate," said Yenai. He climbed onto a rock, letting his voice grow louder. "Our plan hasn't changed. We're heading down the coast, away from the worst of the swarm. Away from Ulamog. Then, though the journey will be long and arduous, we know where we must go." He turned and looked out over the great, wide ocean. What an idiot. "Across the sea, to Murasa. We've heard it's better there. It can't be worse." There were nodding heads in the assembled crowd. One of them, to Kiora's frustration, was Turi's. "A lovely speech," said Kiora. "You've got quite a voice. A storyteller's voice, in fact." "Do you know any Cosi stories?" asked Kiora. "You know," said Kiora. "Cosi stories. Like the one about Ula and the clam. Or the time Emeria mistook a jellyfish for the moon . . ."
"Blasphemy and mockery," spat Yenai. "Turi, you didn't mention that your sister was a trickster. It would have saved us some misspent hope." "She's not a trickster," said Turi, though she looked far from certain. Kiora wasn't one of Cosi's devoted cultists. Not really. She was just a mischievous soul who'd never quite grown out of thumbing her nose at the gods. "It's fine," she said. "If you don't know any Cosi stories, you should have just said so." Kiora shrugged out of her grip and walked out into the surf, letting the bident's points trail in the water behind her. All those currents spread out like threads. She tugged on one and felt it move. "I know a Cosi story," she said. "It's about the time Cosi taught a mortal how to steal Ula's spear." She walked back up the beach, dragging the bident and the sea behind her. "The mortal took the spear and ran. And when Ula came looking for his weapon . . ."
The crowd was silent, attentive—though whether rapt or furious, Kiora could not say. ". . . the mortal spat in Ula's eye." A great wave broke over and around her, slapping against the beach but parting around the assembled merfolk so it did no more than tickle their toes, even as it thundered past them, up the beach, to roar against the rocks. She even spared Yenai from the wave, though she was sorely tempted to let it bowl him over and carry him and his fragile dignity somewhere else. "I'm not going to wait around in some hole, or risk my life on a trek across the sea, while the Eldrazi devour the world," she said, over the rush of receding water. "I'm going to Sea Gate. I'm going to stand and fight." She raised the bident. There was silence. Around her, dozens of merfolk shook their heads, eyes wide. "No," said Yenai. "You're out of your mind." "Kiora, no," said Turi. "I can't go back there. I can't. Please. Don't." "I have to," said Kiora. "You know I do." "I just got you back," she said. "We just found each other again, and I thought . . ."
Kiora gathered her sister in a long, warm hug. "I'll come back," said Kiora in Turi's ear. "I promise." "I'll wait for you," said Turi. Kiora stepped away then, into the surf, and began calling a serpent. If she wanted to get to Sea Gate before Ulamog hit land and rendered most of her assets moot, she'd need to hurry. And half a dozen of the merfolk quietly came and stood beside her. Yenai watched them go, crestfallen. He had to know she'd just pulled away most—maybe all—of the devotees of Cosi in his little troop. Perhaps there'd be less trouble with them gone. Perhaps. But perhaps there'd be trouble only tricksters could solve, and he—and Turi—would have to get by without them. "My sister," said Kiora, quietly. "She's going with Yenai. I need someone to look after her. Please." A tall woman nodded and hung back. She deserved blessings for that, though Cosi gave none. Kiora turned back toward the beach, where Turi, Yenai, Turi's nameless protector, and the others stood watching, with expressions ranging from sorrowful to angry to simply exhausted. "Good fortune," said Kiora. Fortune, Cosi's domain. Even though she really did wish them well, she couldn't resist needling. Then a serpent rolled up onto the beach, and she and her little band of tricksters climbed onto its back. As the beach and the surf and the upturned faces of Turi and Yenai and the others fell away, Kiora waved a quick salute before the serpent's strokes carried them away. She learned her companions' names, heard their grim tales of how life on Zendikar had changed for the worse. She learned that Bala Ged and Sejiri were gone, and felt just the slightest bit sorry for reminding Yenai of his lost homeland. Then she told them the tale of how she stole the bident, and swore it was true, every word of it. Sea Gate beckoned. Ulamog awaited. The serpent swam. And the sea resounded with the laughter of tricksters.